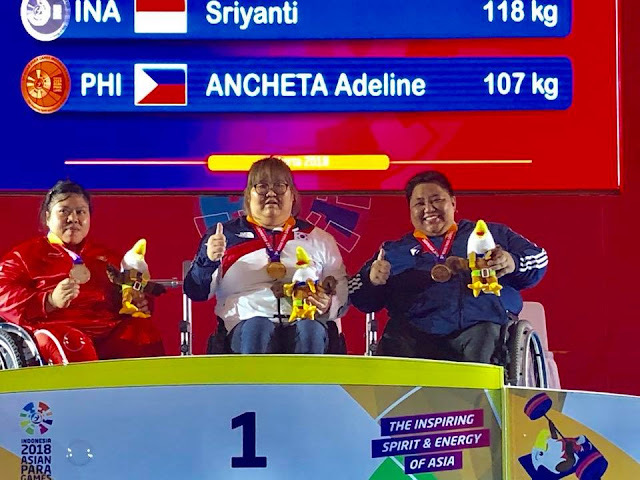 MANILA--Adeline Ancheta netted the seventh bronze medal for the Philippines in the Asian Para Games in Jakarta, placing third in the women's over-86 kilogram powerlifting event. Dumapong lifted a maximum of 107 kilograms, enough for her to make the podium. The Philippines also has six golds and the same number of silvers in the event. Lee Huyn-Jung of South Korea set a Asian Para Games record in the said event by lifting 118 kilograms to take the gold. Sriyanti of Indonesia captured the silver.